How much are you willing to pay for 12 more PCIe lanes? The i7-6850K is as fast as the 6800K, but the added cost for what amounts to a couple percent makes it the odd man out for Broadwell-E.
Broadwell-E is a strange beast, much like Broadwell for desktops. The desktop Broadwell very nearly didn't happen, and the number of people who actually own such a system (outside of reviewers) has to be trivially small. The short story is that Broadwell didn't prove to be much faster than Haswell / Devil's Canyon, so Intel opted to equip the desktop models with their higher performance Iris Pro Graphics—which also increases the cost—and at the same time drop clock speeds. When I reviewed the i7-5775C, I wasn't particularly impressed. The chips were fast enough, and they could still overclock, but for enthusiasts there wasn't a good reason to opt for Broadwell over Devil's Canyon, particularly given the price premium. I just posted our mini-review of the Core i7-6800K, the least expensive and arguably most compelling product from Intel's Broadwell-E lineup. That's a decent processor and it's currently the best way to get a 6-core Intel chip (or you could still snag the i7-5820K for $50 less and drop 1-2 percent in performance after overclocking). I've also posted a massive overview of Broadwell-E with all the individual test results, if you're interested in additional details. 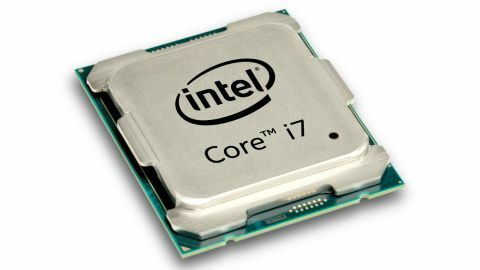 Today I'm looking at what is perhaps the least compelling product in the Broadwell-E stack, the Core i7-6850K. Much like Broadwell for desktops, this is a part that offers questionable features at a much higher price—$600 to be exact. That's $180 more than the 6800K, and the key difference is you're getting a small bump in clock speed and 12 extra PCIe Gen3 lanes—40 instead of 28. If you're an enthusiast planning on overclocking, the difference between the two CPUs is almost non-existent, while at stock clocks the 6850K has a meager three percent lead on average. But what about those extra PCIe lanes—they must be worth something, right? In truth, it depends on your intended build. While motherboards with as many as seven PCIe x16 slots exist, those boards have to limit the slots to fewer than 16 lanes each if you try to fill them all. And really, with dual-slot graphics cards it requires PCIe riser cables to even have a chance to populate six x16 slots. That's a messy solution in the best of cases; in practice, almost no one uses more than four PCIe slots, and even that's very rare. My beefiest test system has three cards at most—two GPU and one PCIe SSD, plus another SSD in the M.2 slot. If I want a third GPU, I have to remove the PCIe SSD—there's no room for it! The two SSDs get x4 lanes each, and the GPUs either run at x8 or x16, depending on the CPU being used. That means 40 lanes are used if the GPUs are on x16 connections, but I could also get by with just 24 lanes with the GPUs on x8 connections. The question is, what sort of drop in performance will result in going from dual x16 to dual x8? If you're running older GPUs like GTX 980, there's not a huge difference between x8 and x16 Gen3 connections (based on previous testing). But Pascal seems to be changing that, or at least in limited testing the GTX 1080 very much prefers x16 Gen3 connections. It could be drivers or other elements playing a role, but I've seen differences of anywhere from 0 percent to 35 percent when comparing dual x16 Gen2 connections to dual x16 Gen3 connections. Now that Nvidia is recommending against more than 2-way SLI, and frankly outside of 3DMark and a few select games, scaling beyond two GPUs has always been crap, there's no need to worry about 3-way or 4-way GPUs. But even 2-way SLI appears to benefit quite a bit when going from 28 and 40 PCIe lanes, at least if you're using top-end GTX 1080 graphics cards. But the people spending $1200 or more just on graphics are the same people that would consider 8-core and 10-core processors, again making the i7-6850K a niche proposition. If your main goal is to have a highly capable gaming system, Broadwell-E and the i7-6850K aren't the best solution. At stock clocks, the i7-6700K is a few percent faster, and the X99 CPUs all fall within a narrow range with the fastest chip beating the slowest by two percent. Games still haven't really moved beyond 4-core scaling in most cases, and even that is questionable—short of running some demanding background tasks while gaming, Skylake is currently the best solution. For CPU intensive workloads like video editing or 3D modeling, the X99 platform has some real advantages. However, note again how closely matched the i7-5930K, i7-6800K, and i7-6850K are—they're within three percent of each other on average, mostly due to clock speed differences. (The i7-5820K is about 1-2 percent slower than the 5930K, if you're wondering.) Even in the individual test results, the 6850K never wins by more than five percent over the 6800K and 5930K. The one small saving grace for the i7-6850K, at least for the sample chips I have for testing, is that it uses less power than the i7-6800K. I'm guessing the chips binned for 6800K aren't as good as the 6850K, though there's always variance and I may simply have a poor 6800K sample. But when you're looking at a system that will cost well over $1000, saving 10-30W in power is hardly significant. Running 24/7, even with a high price for power, 30W in power savings works out to $50 per year or less. All of Intel's K-series CPUs, including all Core i7 parts for the X99 platform, are readily overclockable. For the i7-6850K, we needed the same 1.40V as the 6800K to hit 4.4GHz. Since these chips have six to ten cores, you'll also want some serious cooling. They're rated at 140W stock, and with overclocking some of these chips can easily pull 200-250W. The test system uses a Corsair H100i v2 to keep temperatures in check, but maxing out six cores at 4.4GHz can still push temperatures into the 85C range. Given most of our games are already GPU bottlenecked at the 1080p Ultra settings we use for testing, improving CPU performance via overclocking doesn't really affect things too much. On average, the 6850K improves gaming performance by two percent, but all the other Intel chips improve by a similar amount so it's a net wash.
For CPU intensive workloads, overclocking is understandably more beneficial. Here the 6850K goes from a stock 3.6-4.0GHz to a steady 4.4GHz. Depending on whether it's running a single-threaded or multi-threaded workload, the overclock should improve performance by 10-22 percent. In practice, the test results show a 17 percent average improvement, with individual results increasing by 13-23 percent. That makes sense given most of the tests are multi-threaded workloads where the stock clocks will be closer to 3.6GHz. Overclocking also increases the power use by 26W for our gaming load; not shown in the charts, idle power is also up 9W and CPU-only loads (Cinebench R15 in this case) use 70W more power. The 6850K does better than the 6800K sample for power draw, but power use isn't a strong point of the X99 platform. If your system mostly sits idle and occasionally runs moderate workloads (including games), Z170 is a superior solution for energy savings. An overclocked i7-6700K for instance uses 50W less power at idle and in CPU-intensive workloads, and 25W less power for gaming. If you're going after every last drop of performance, getting a CPU with 40 PCIe lanes might seem like a good idea. The problem is that if you're really chasing performance, you should also be looking to the 8-core or 10-core parts. Professional users might even look at the Xeon v4 chips with up to 24 cores, which can be great for running virtual machines or other server/workstation workloads. Yes, these chips cost more—in some cases you could spend upward of $4,000 on just the CPU—but the people using them do so because over the life of the hardware, the performance increase will easily more than pay for the hardware. The i7-6850K isn't a bad chip by any means, but it's priced in such a way that there aren't many situations where I'd recommend it over the 'lesser' i7-6800K. As the performance charts show, the two chips are within spitting distance of each other and they hit similar overclocks. The wild card is performance in 2-way SLI/CF configurations; I've only checked Nvidia's GTX 1080 at present (and only in limited testing), but there are definitely games where having the extra PCIe lanes will help performance. Is it enough to warrant the additional cost? Possibly, though it's still a significant jump in price for a minor extra feature. If Intel were charging $50 more for the extra PCIe lanes, it would be easier to recommend, but unless you know for certain that you are going to run SLI or CrossFire with top-end graphics cards (GTX 1070 or above, or R9 Fury or above), I recommend just sticking with the i7-6800K or even the i7-5820K. With Broadwell for desktops, Intel paired an 'enthusiast' processor with their best graphics solution at the time, and charged a hefty price premium. The problem is that any enthusiast is likely already running a discrete graphics card, so the Iris Pro Graphics would end up going unused, and while the L4 eDRAM cache can improve performance in some workloads, it still wasn't worth the price of admission. In a similar way, the i7-6850K takes the reasonable i7-6800K and tacks on some extra PCIe lanes—because more is better! People running certain multi-GPU configurations will benefit, but the $180 price premium could arguably be better spent on a larger or faster SSD, or a better GPU, or more system RAM. No one is going to feel bad about the performance offered by the 6850K—it's every bit as fast, and even slightly faster, as the 6800K. But if the $600 i7-6850K is in your price range, I think tacking on another $490 to get the two extra CPU cores in the i7-6900K is at least worth considering. Because clearly, money isn't the driving concern for someone putting together a 6850K build.